Are you a beginner and you want a blog? I recommend to use Blogspot or Blogger for your own business or your personal blog. 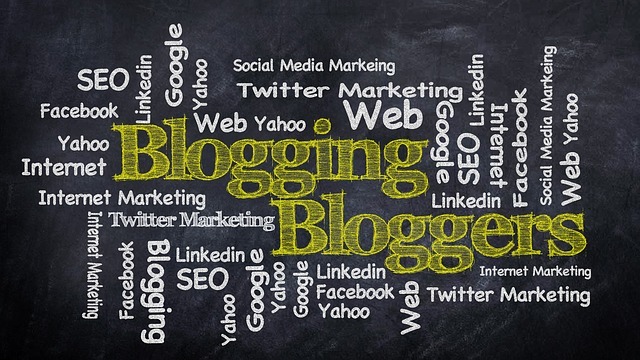 Bloggers are a another platform, is number one blogging industry found in internet. With more than a billionth of members compare to the other platform like Wordpress. Why you Create a Blogger Blog? Using blogs in bloggers you can express yourself in a professional way. By using your knowledge or skills by writing it and posting it on your created blog site. And might be, you can help other peoples to solve their problem and even help them to elevate their lives by imparting knowledge to them. And even it can elevate your daily living because of a good income of your blogger blog. Blogger blog is totally free, you will own a subdomain from Google, either you will setup a custom domain and templates. So, I created this post for you, so that you can start to create your own, a full proof guide for your start. Without learning basic HTML or reading a tutorial in your internet browser. 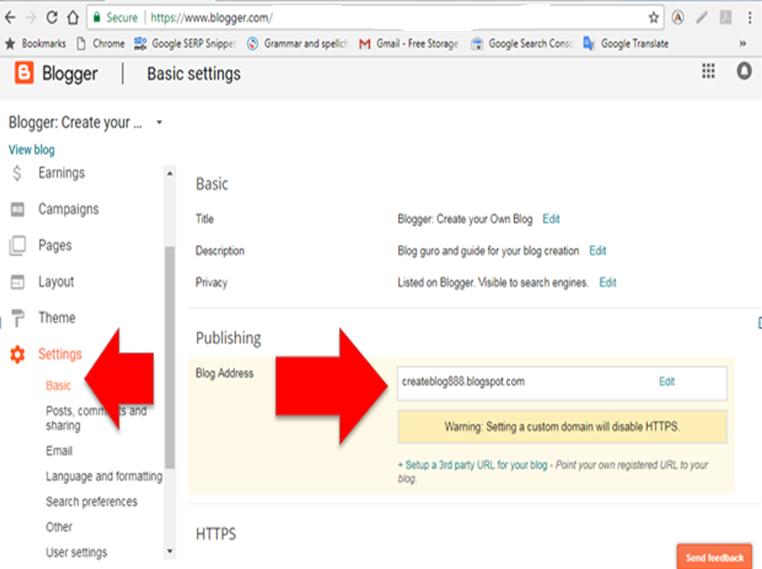 Setup your blog site together with the blog name and URL. Select a theme for your blog. 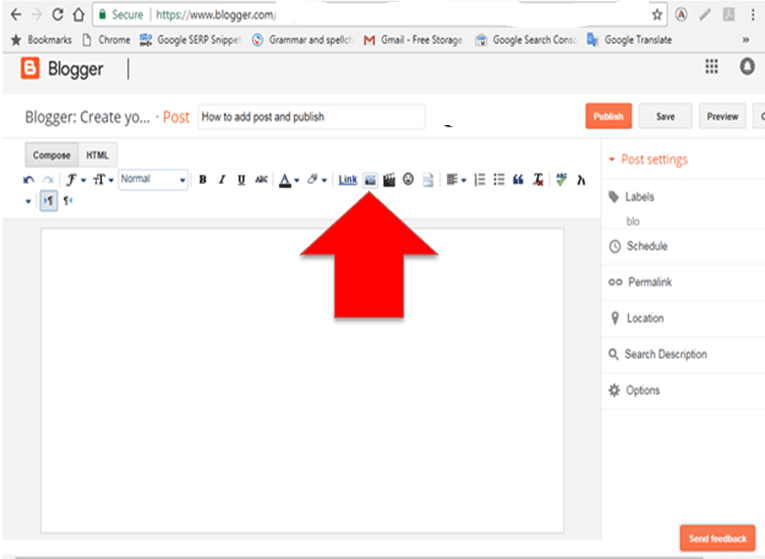 Create and setup your blog description and preferences or called Meta tags. 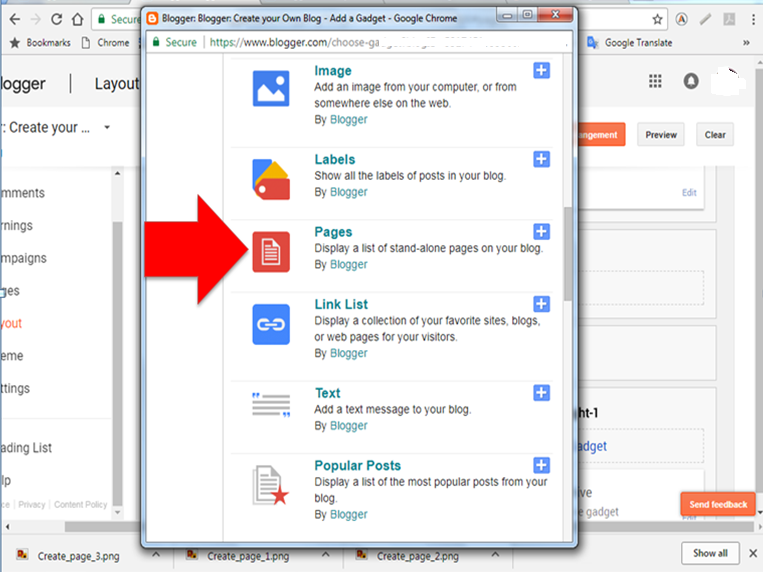 Create layout for widgets on your blog. How to add post and create pages. Register a domain and hosting. Creating a blog and maintain it is not easy. You need enough time and even your spare time will be used. Sometime I've found new blogger make mistakes and resulting in abandoning their blog altogether. And this is a wrong decision you ever made instead of keeping it on track. So I want you to read this post and follow the instruction. I'm going to walk through with you in setting up the whole process. Ready to create your blog today!Alright let's make this true. 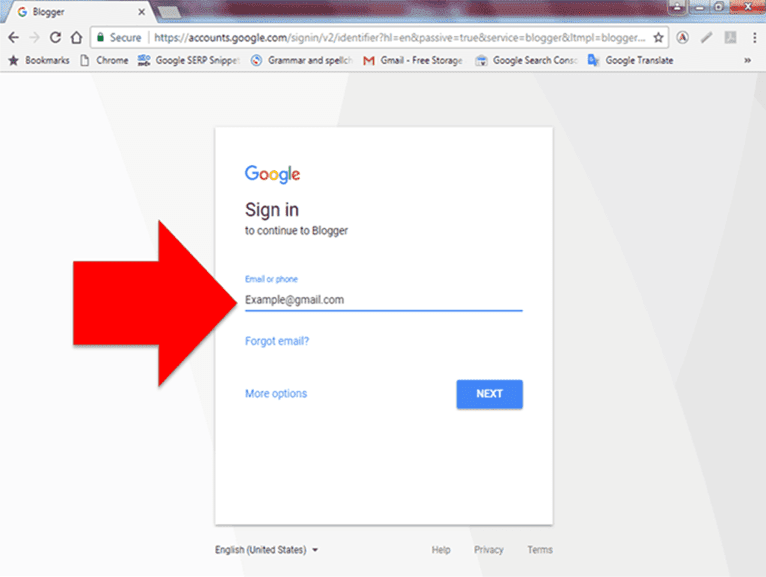 If you have a gmail address it's better, you can now login by typing in your browser "blogspot.com"
The blogger site will open, just click create your blog. In another window, enter your email address in the bar provided and press enter key. You will brought into the next bar which is to enter your password and press enter key. 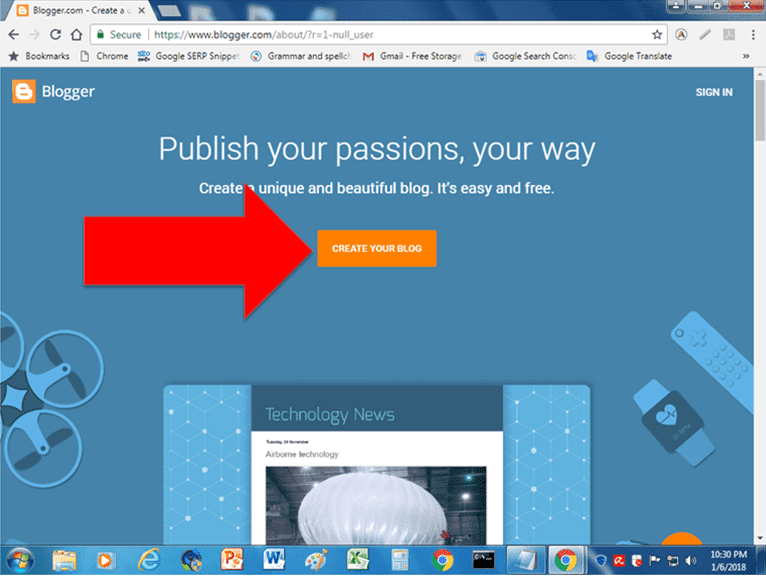 Step 2: Setup your blog site together with the blog name and URL. 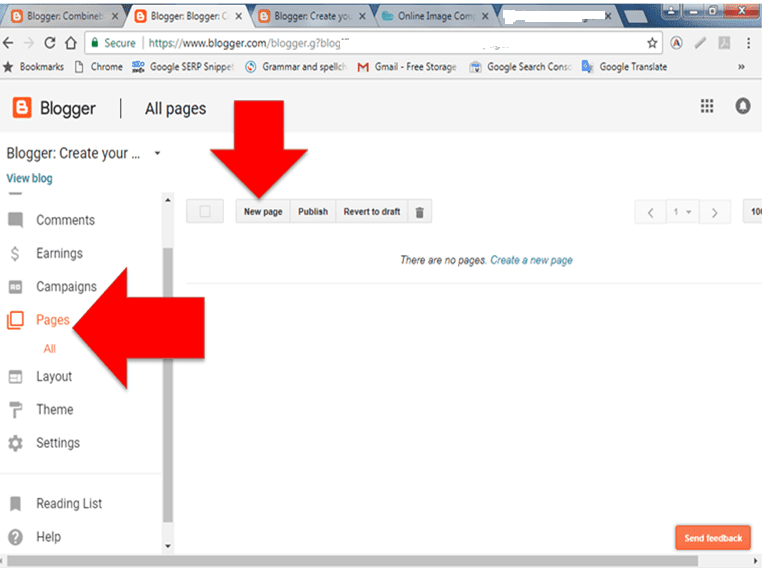 Once you login, type the title and URL of your blog in the bar provided. Same as what you will see in the image above. After you successfully create your blog title and URL, you need to select your blog theme. See the image above. 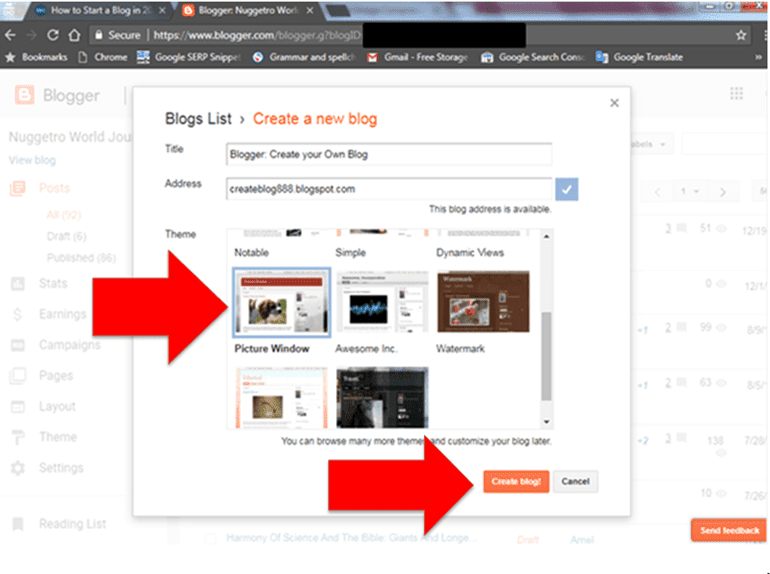 Then click the "Create blog" button. 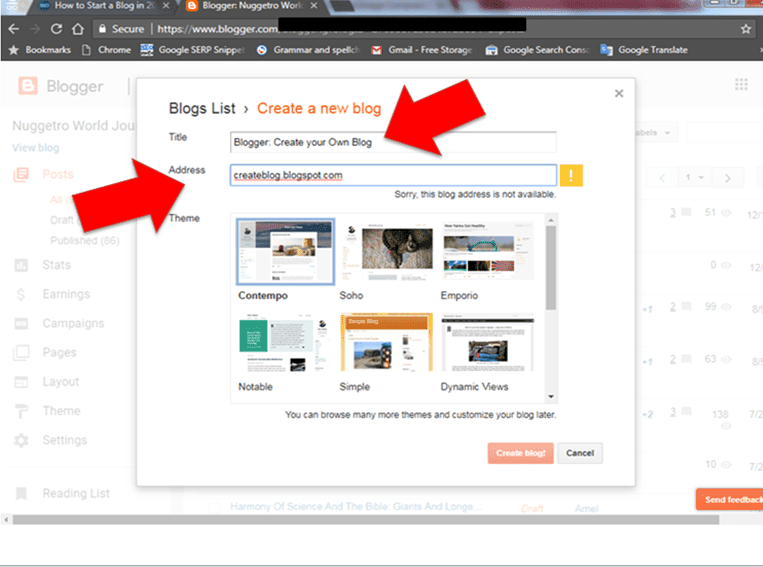 Step 4: Inside the Blogger Dashboard: Create your blog description after the blog title. 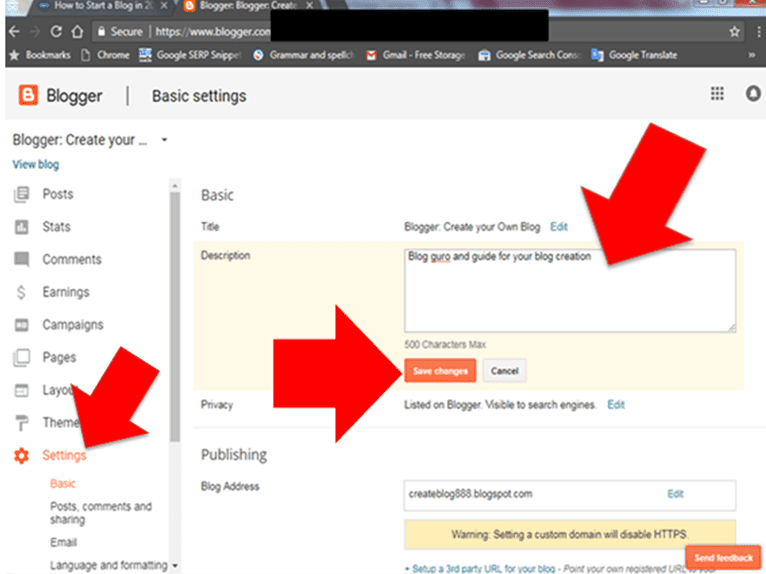 Inside Blogger Dashboard: At the right panel of your screen, click settings, and click Edit of the Description. Write lesser words for your description not more than 500 character. And don't forget to click and save your description. 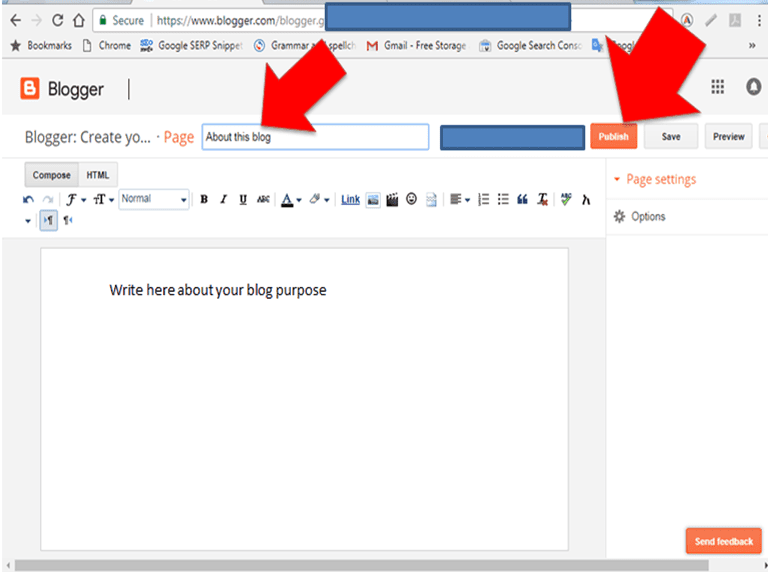 Step 5: Inside the Blogger Dashboard: Create your blog search preferences or called Meta Tags. 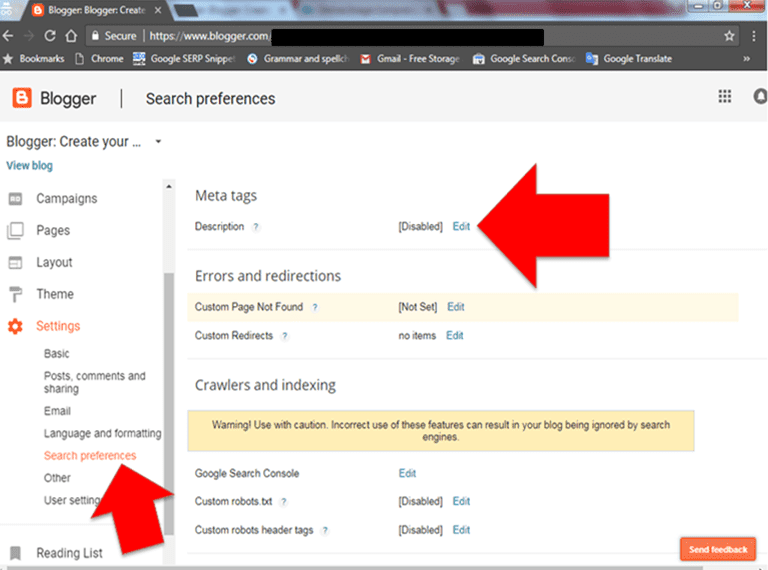 Click settings and click search preferences, now in the right portion at the top, you will see the Meta Tags description, then click edit. This Meta tag, is a snippet of text that use to describe your blog content. That helps tell the webmaster search engine's of what the page all about. After you click the edit, click yes and in the text area, a bar writes the description not more than 150 characters. 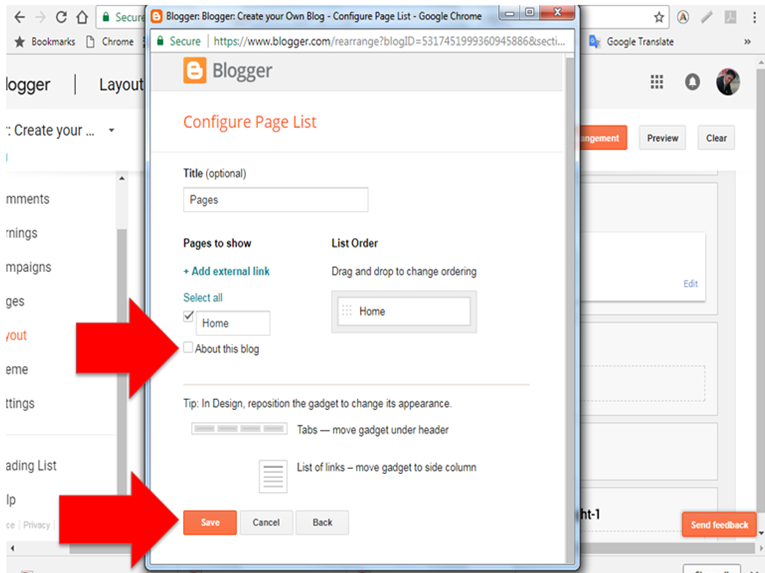 Then don't forget to click the button "Save Changes"
Step 6: Inside the Blogger Dashboard: Create Create layout for widgets on your blog. Blog widgets is an easy to use design, only to drag and drop without having knowledge of HTML and CSS programming code. Mostly position at the right side panel of your blog site. Example I use picture window as my theme, this theme design have only right side bar. Click layout in the left panel and click "Add a Gadget" at the right panel. In another window, select a gadget like example profile, above, I put arrows is very important. You need to setup this in your blog. Write the title if needed as necessary like the image above here. Then don't forget to save your gadgets to take effect on your blog. You can see it by clicking the "View Blog" above left side of your screen. Repeat this procedure to complete your widgets, like the archive, label, and blog search. 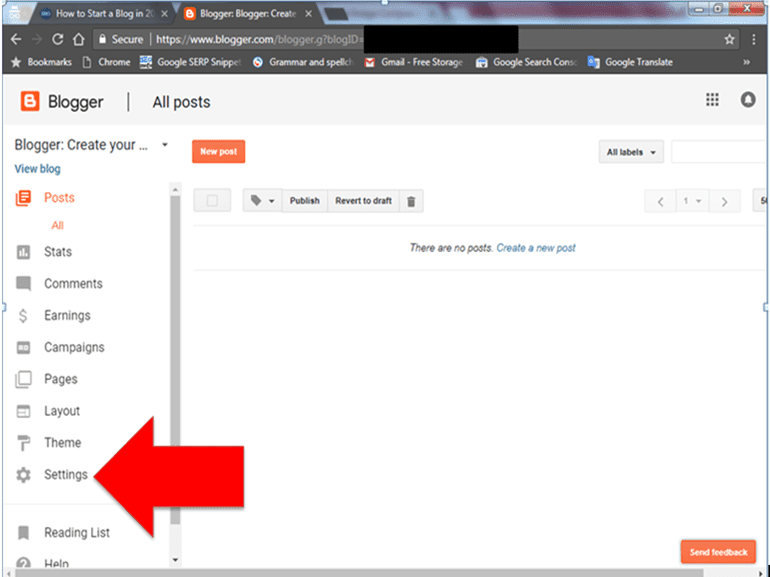 Step 7: Inside the Blogger Dashboard: How to add post and create pages. Click Pages at the left panel then at the right portion top click "new page". Write a page title on the bar provided and click publish button at the right side. Now displaying the pages as page menu at the top of your home page follows the image below here and the instruction. 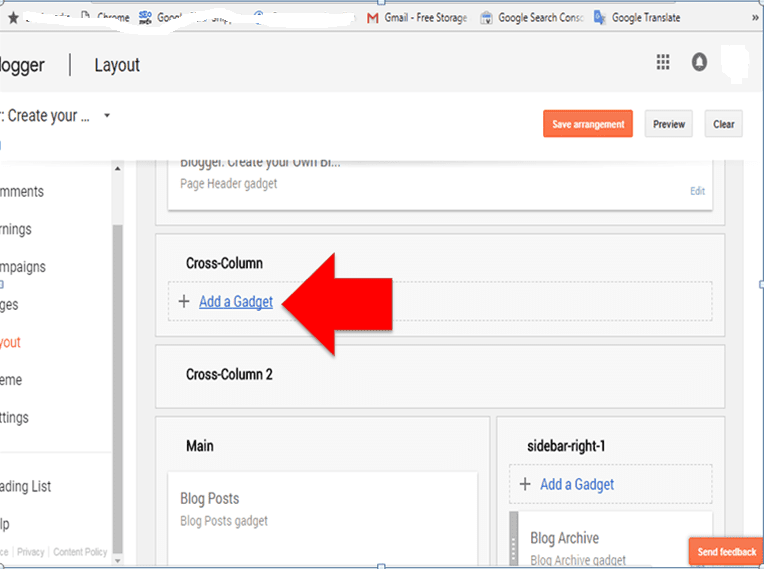 Go back to the layout menu on the left panel of your blogger dashboard, then click "Add Gadget" at the top called cross column. In the next window click "Pages". 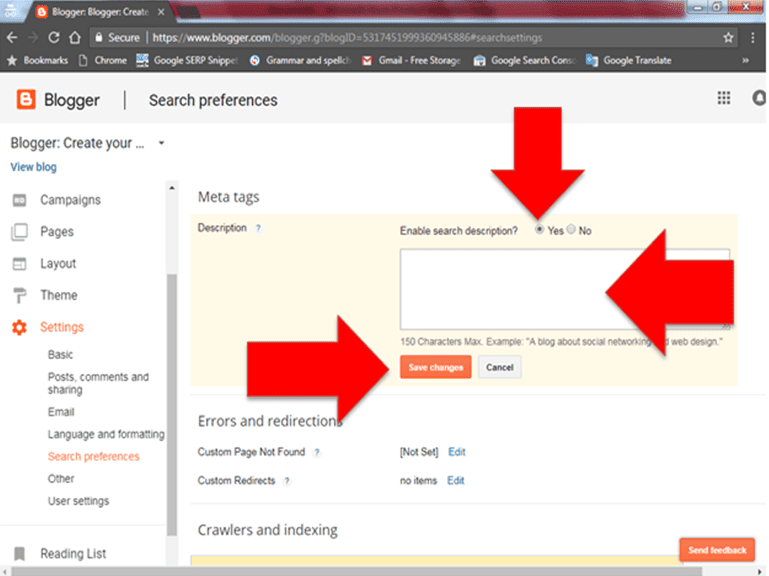 In order to display the Pages, check box the pages that you create. Same as what describe in the image above here. Then don't forget to save your settings to take effect. 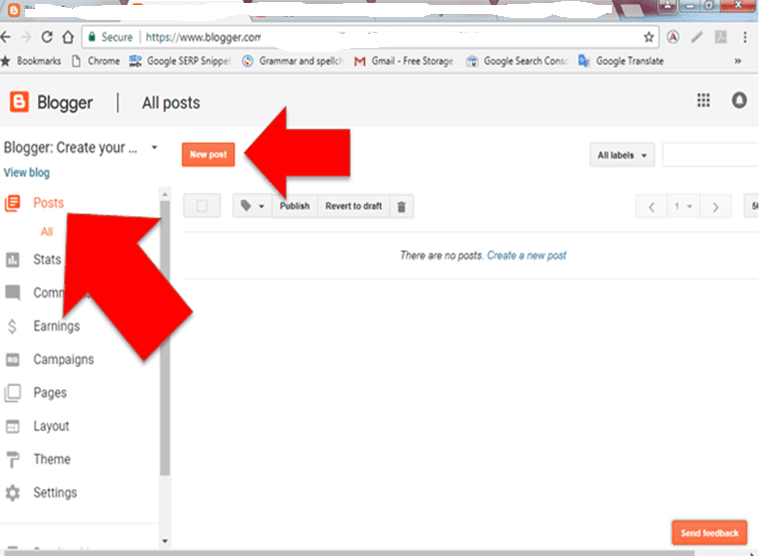 Now preview your blog by clicking the "View Blog button at the left top of your screen. 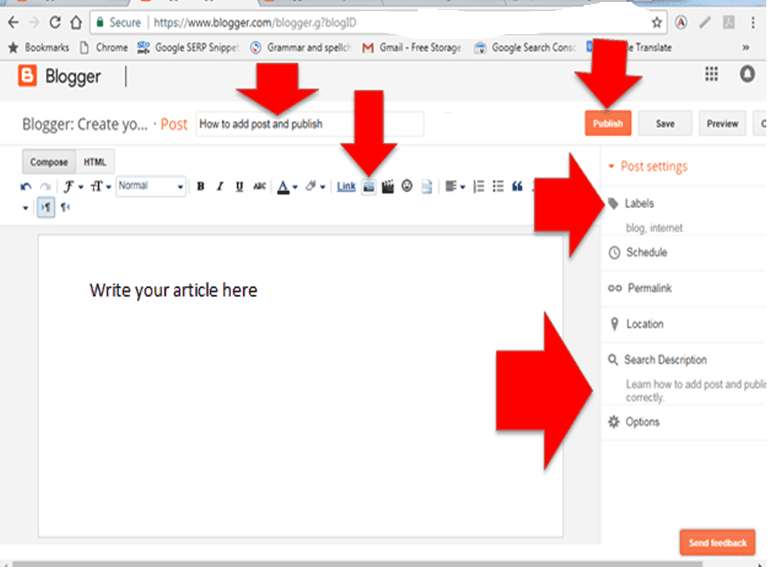 Step 8: Inside the Blogger Dashboard: How to add post and publish it. Click "POST" at the left panel of your screen, then click "New Post". Inside the compose interface, you need to write a Post title located above. Write your article at the center. Then set your labels and write a search description about your post or article. Learn what are the important of publishing a post. Labels- is a word use to categorize your article or post in order to easily find your post by your user. Search Description- is a group of word not more than 150 words use to hold the keywords and short description of your post. That can easily understand by the search engine of webmaster like Google. 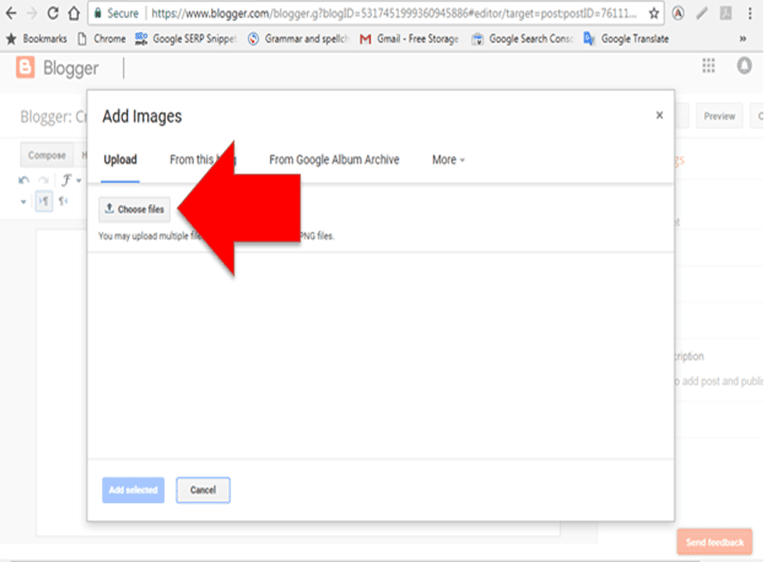 Step 9: Inside the Blogger Dashboard: How to add images in your post. Posted images are the primary need of your article before to publish. It's a catching eye of the users to easily understand about your post. Follow the image below and the instruction. In order to add image in your post the button describe of the image above here. 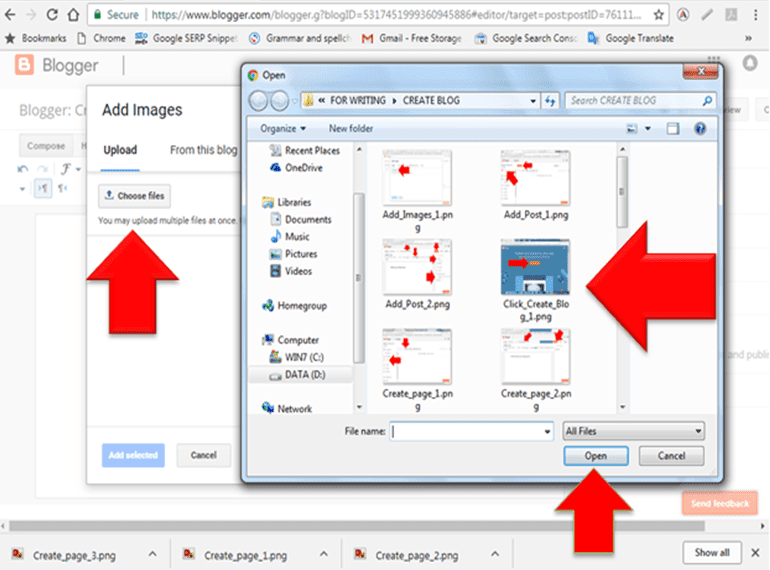 Then click choose files button left side of the add images window. Then select a file in the next windows and click open button located below of that window. Step 10: Inside the Blogger Dashboard: Setup a custom domain. To setup a custom domain of your blogger blog is a good decision you ever plan. Owning a custom domain, rather than a subdomain, like createblog888.blogspot.com,,, is not easy to memorize by the user, rather than createblog888.com. Another you do not directly hold your blog site. You have no full authority. And some of the user, avoiding the subdomain site. The best domain and hosting where you can purchase, I recommend Hosgator. This company is very professional. And they can help and address your problem arising during and after the setup of your new custom domain. Step 11: Start Growing your Blog: By linking your blog in different Social Media like Facebook and Twitter. After completely setup your blogger blog, you need to start building links in order to grow your site. Quality traffic is the importance of your site, quality traffic means is an income. In order to achieve this goal you need to link your blogger blog in Facebook and Twitter. In my case I use IFTTT to link my every post in Facebook. Another is planning a better marketing campaign, you can use either email marketing and social Media. But this requires a quality contents of your site. Do your best to write a good, informative and quality post. To become a professional blogger and financially free because of enough income from your blogger blog is not easy. You need enough time to maintain your blog, some bloggers paid writers to write a quality article. And hire an SEO company to maintain its site technical errors free.